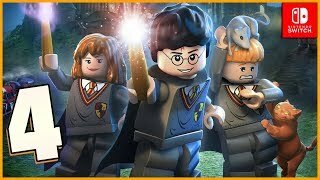 The LEGO Harry Potter Walkthrough Years 1-7 Remastered Collection Nintendo Switch! Welcome back to the Wizarding World of Harry Potter. This Game contains all 7 Films on the Switch. Special Thanks to Warner Brothers for providing a copy of this game before it's Halloween 2018 re-release. 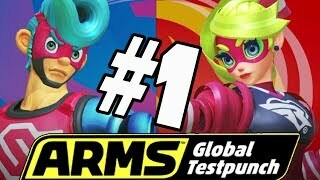 This video features co-op commentary with my Wife. 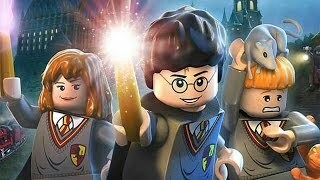 Hey what's happening muggles wizards and you filthy mudblood welcome to Lego Harry Potter collection for the Nintendo switch containing both Lego Harry Potter years one through four and five through seven special thanks to our friends over at Warner Brothers for providing a copy of this game before Halloween so we will be going through both games and this game releases as we said on Halloween and it contains the entire Harry Potter collection so make sure you use your wands to smash that like button and tell us your favorite Harry Potter movie in the comments section below. Warner Brothers games presents a tale of. 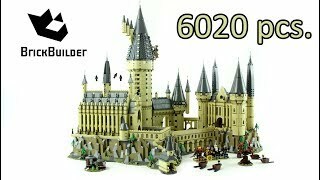 Walls and wizardry and spiders and black. Cats what are you cooking up kids probably trouble knew it oh very. Creative way to show off TT tales jinx. Now I've never played the Lego Harry Potter games so this is gonna be interesting I don't even know if there's talking in this one or not I guess we will find out won't we and that will. Probably be Harry Potter jokes and terrible British accent so apologies to our UK friends in advance it's just something about the atmosphere of this game that just makes me want to be a wizard even though I'm a muggle. Hello Dumbledore oh it's back when there. 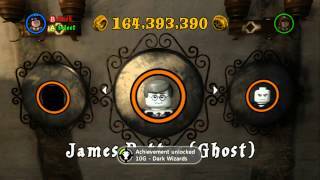 Was no voices yep this is how Lego games were when we first started yeah they were all the game you know a slapstick. And this is where babies come from. He has the scar oh my gosh oh it's time. What's this Hogwarts. Give me that no you can't have that but it's the mean Olli what is it uncle. Yeah something like that he's literally. Licking his plate clean yes so they keep. Trying to get him the invitation okay. That's gonna buddy meanwhile the kid is just like dinner yeah so take that you muggles okay that. Was an internship yeah oh here we go. Merry old London yep double decker buses. Did we miss the line already you're a wizard Harry oh yeah basically Oh sadness all right here we are inside of I don't know where we are we're in a probably wizard place. So far this isn't too bad I mean it's kind of like an HD update I mean I don't remember when the original collection came out because I mean I am NOT a big Harry Potter person I'm a superhero guy. Toils it's never a good idea for you to jump in because it could be bad oh there we are mr. Potter I'll switch up to him but now there were a lot of Lego games that didn't have voice acting it wasn't until Lego Batman 2 where voice acting became more mainstream in the Lego game so I'm guessing that this came out before like a Batman - oh yeah because Lego Batman 2 was one of the first original Lego stories yep to have. Voice acting yep and it was original - there was also something called LEGO Island that was a PC game that had voice acting but oh I believe I'm supposed to go over yeah so this thingamabob on to this there we are yeah I don't remember too much about Harry Potter but I do know that right like he was staying with his uncle or whatever and basically his uncle and the. Family mistreated him like whole one so he was like Cinderella and then then he. Got the invitation they kept making it like he couldn't get it and but these people are wizards so they could do anything to get the invitation to him so sent about the need and then this guy on. My phone I cannot believe I forgot his friend everybody spread the same Oh big guy hi grid there you go yeah there we go he's the famous always what what happens. If I hit one of the witches that's not sure who I'm just Harry you want wizard Harry yeah I'm waiting for your grandsons Dark Knight to just be like Harry Potter yeah cuz he was obsessed with that if I remember clearly I vote I've gotten the line wrong all the time I thought it was doing the wizard a warrant it's you're a wizard Harry I'm a watt I thought you just said out what oh well whatever this whole time oh I have a roll technique yeah never mind so now we're inside of more of the Wizarding World yep we're hanging out with Hagrid and Harry I always think Dumbledore is such a weird name for the very respected person that you know as a teacher because human Gandalf is essentially Gandalf yeah there's so many similarities between Lord of the Rings and Harry Potter that it's kind of staggering nope maybe we off well I mean Dumbledore and Gandalf almost the same as they do now did we ever do Lego Lord of the Rings on this channel or was that the other one don't recall I mean yeah. There are similarities because it's like fantasy and wizards but I feel like the. Theme behind everything like yeah I don't know there's there are some means to do see did the best like explanation it was very similar because they had Gandalf meet Harry Potter because he was looking for Frodo and he meeting mr. Potter yeah but the whole like thing of you know Harry Potter he's at a school hanging out and Gandalf is fighting on war so it's like totally why don't you come in actually it took a while for the. Blond to find it so just jump in and hang out up on there you're a little hairy so you don't have many powers I'm a Walt Harry I'm not a lizard I'm just Harry oh there was a small person up there and literally this is our first time ever playing the original Harry Potter collection so yeah that um that's do you see thing with Harry and the wizard look. Almost like I think Dumbledore is such a weird name for like a respected professor because it kind of sounds like his name is goofy or something and why did I steal the spider okay it's been a.
Weird no you don't you're just a Harry. It's because I am a wizard but I haven't really learned to use my magical powers yeah so we need to find different ingredients to put it inside of the cold room that makes us I don't know why it's not because I have to use well my ice cream power now come back this way mr. Potter jump on that okay cuz you were tiny and small and then bounce over that way well done yeah I mean it's essentially a Cinderella story because Harry is treated like basically royalty at the school where is he's treated like garbage at his house whoa cult room has. Exploded is there anything else for us to break no it appears not so we go forward aha there we go that's what super strength is for good job hey actually I don't even know if I had super sweet it's good having a friend who's like gigantic in size he actually is really big in the movies isn't he it's like huge thank you for this dose. Probably the books as well speaking of. Books I read half of the first books other than growing past any of those and you watched a lot of the movies in you something like that yeah I watched a fair amount of them I don't know what all of them when we were in Boston used to go to the movies a lot it was like kind of your thing that's good. 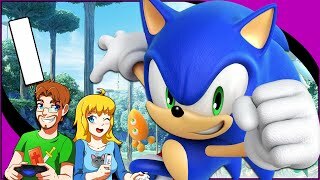 Especially because you rose working to get the channel going in oh yeah I always thought well I'll let you do that and I'll go watch a movie later I wish I. Had a magic wand to like organize my house create because the wand is just like its tax everything so neatly and up a button what what hello is that oh. That's what I was supposed to do he doesn't like you here up hello okay. Yo what's up what is that a key I think so he was just coloring a picture so well he was getting really into his picture so yeah I mean what's great about these you know cut scenes and stuff from the old little games they almost mimicked exactly the scenes from the movies and stuff so they were kind of parodies of them but because I can't really remember all the movie scenes which I can't yeah yeah that's what's great about when they used to do licensed games they would definitely make parodies kind of like silent movies in a sense they would just have like little grunts and things like that yeah it was like in case you have not seen that scene you'd kill to know you know I've seen it or it kind of gets you up to date on what this happened like almost you know basically every scene that they do is I call a scene in the movie so dialogue. I'm making all these lit up because I can I have a wand yeah I mean I would love to play Lord of the Rings game but when they did Lord of the Rings they put the music and voices it was a very tense Lego game if I remember correctly too tense because Bob Bob Bob the music and. Everything is just very tense and the dialogue and stuff yeah they couldn't really make fun of the game the way that they did some of the other movie stuff but they did a really good job when they did the Jurassic Park films I feel like maybe they didn't want to make fun of it because people like loved Lord of the Rings so no I think they did the best they could but it was such a serious movie and it was after if it was during. The time where they just like they did with the lego indiana jones and star wars games where there was no talking then I could see that what is over here. Oh I made a torch fly in the air then I. Think we have to get over to that area somehow yes so we need that tiny man where to go he has a key oh that's who you were okay ice only. Goblins can open things well well my. Goblins can use these blocks that's what I'm trying to do there we go my tiny goblin miss maybe I will try being the goblin actually because he didn't really do more stuff than whatever I'm only very strong characters can pull heavy chains I'm not a very strong character well that's good this is pretty clever. Ex sweet I'm in this thing yeah you know. I'm a main reason why I didn't really watch a lot of the Harry Potter movies to begin with I watched a lot of them towards thee and then I watched like the first or second one and it was because I not a big fan of school school the. Goblin needs to use his key just stand over there and hit the a button eventually he does it thank you. That's what happens when you have a magic wand whoa there's a dude inside painting hello no dude I'm just happy there's another. 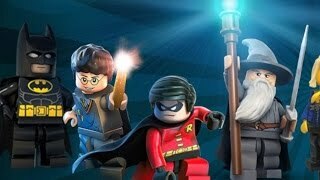 Lego game on the switch there really aren't that many yeah I am excited to see the rest of it and I'm hopeful maybe they'll do like a Lego Batman collection that would be awesome Jones won for this. Which I'll probably redo those when there's another Indiana Jones movie supposedly they're making another one hopefully without Shia LaBeouf yeah well I mean now he's like cannon or whatever no no he's not his son could be gone like maybe he went sudden in a terrible accident no no he just he got married and he left and we never need to see him again and Indiana Jones is a grandfather that. Would be great or maybe they could just. Like recount the movie and do something completely different stop falling so I. Have to say that my favorite Harry Potter movie and book is the first one that Goblin it's just like only goblins. Just use Keene it's just fun and like very sweet and you know childlike and then it just gets very dark like later on well I mean that's what Harry Potter is oh that's why I watched like a lot of. Anime normally careful you don't like jump off the clip again I know we need our studs off you go you're a wizard how. Hmm oh we should have had Harry there's your wizard Harry Harry doesn't do anything he's a true wizard well it's. Bad here oh yeah but um something that like people may like not not remember about the first movie which is kind of interesting is that and in book and stuff is that one reason why it's so interesting and like Harry's all wide-eyed and excited about everything it's because he's grown his whole life up in the muggle world so and all these. Look at all the gold he's like can I have it no he's like sure Harry it's a.
Goblin party he's like no no nothing to. See there sorry this is yours so this is. Like a little bank or something yep oh. It's time to get the wand oh yeah anchor just grab something who knows um okay I think there was something like that was implied like old name behavior is bad then it turned out he was good because he's always good we. Have a fine selection of sticks they all. Look the same another stick. Oh this is a very special see it likes. You very it has magical sparkles and now Harry Potter has magic how does it feel and this you're an owl. He tried to be cool for a second but it didn't work out well ah yes the house. Wizard total I'm what I just like it. 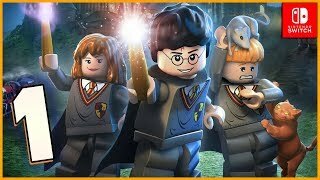 Because it feels like the old-school Lego games that we really used to play a lot of like from the Lego Star Wars Lego Batman Lego Indiana Jones yep Lego no I. Never did Lego Pirates of the Caribbean I thought about it and even then like it was so much fun to play indeed it was without dialogue it was really funny cutscenes and stuff yes oh the train. Station I did see the first one the Chamber of Secrets right uh no the. Sorcerer's Stone is the first one I've seen the Sorcerer's Stone in the Chamber of Secrets well. All words Express oops we're honest so. Much fun you broke my glasses oh that's remind me yep probably I think. It is she always hangs her on wrong but then she says that he's kind of like despicable and she can't stand it when she hangs around him all the time which. 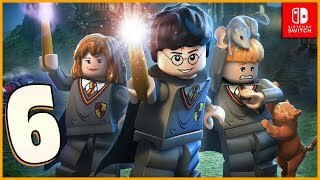 Is why these Lego Harry games to really. Be changed to Hermione and Ron the game and the movie there's that one girl lady. So this is the Hat that actually decides what group you're gonna be in there's. Snape no no I don't want to take it hey. Snake the other guys goes the Slytherin. High five Dumbledore is amused it's.